EXTRA LARGE. 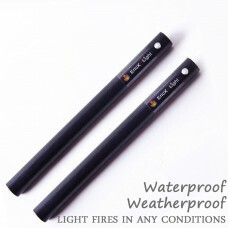 Length: 6"(152.4mm); Diameter: 1/2 inch. Pack of two, super value pack with unbeatable factory pricing. FITS ALL WEATHER. Designed to light fires in any conditions. Waterproof & weatherproof. DIY YOUR SURVIVAL KIT. With a Lanyard Hole, use it to keep product secure. A great gift for all outdoor survival sports lovers. Super thick rod provide you a decent shower of sparks to light fires instantly. Durable for this super thick rod lasts more than 12,000 strikes. A perfect size for backpacking, hiking, camping, hunting, fishing, boy scouts, BBQ, and everyday emergency preparedness.